They were in the same World Cup group in 2014, in which France beat Switzerland 5-2 in a goal fest. Sunday's game, however, was the complete opposite as both sides failed to score in a rather tedious night in Lille. Switzerland came into the game seeking just a point to see them through to the knockouts, whereas the hosts were looking to pick up a win and complete a perfect record in the group stages. The match-up in Lille marked a special milestone for goalkeeper Hugo Lloris. It was his 54th time captaining the national team, equaling his manager Didier Deschamps' record. Speaking of Deschamps, he showed once again that he wasn't afraid to make alterations to his lineup, opting to rest star man Dimirti Payet for his outstanding performances in the first two games. France, wearing white instead of their famous blue colours, had the better chances early on. Their main man Pogba, playing on the left of a midfield three containing Premier League players Yohan Cabaye and Moussa Sissoko, was menacing to start the game. Despite having a minor hiccup when defending a Swiss corner on the defensive end, the Frenchman began to show why he is one of the most sought-after players on Earth after rattling the crossbar not once, but twice, in the opening 20 minutes of the match. The first was a dipping strike from the edge of the box that was pushed onto the woodwork by Switzerland's number #1, Yannn Sommer. Moments later the former Man Utd man, on a deep midfield run, unleashed a powerful left-footed shot that had Sommer rooted to the spot, but the outcome remained the same and the ball hit the bar and went over. An impressive start from the beast, who was in hunting mode. Physicality was the main theme of the first half at the Stade Pierre Mauroy - battles in the middle of the park, Pogba and Embolo's gymnastics, Xhaka's shirt being ripped. But all-in-all it was not a great 45 in terms of footballing ability, with the pace having dropped significantly towards the latter end of the period. There was the occasional flash of brilliance, but both teams had not showcased what they were truly made of. Switzerland had defended well and manged to contain the potent French attack but they needed more out of their own forces, especially Shaqiri who had an underwhelming first half, much like his performances thus far in the tournament. On the other hand, Deschamps' concern would have been how to get more out of his players, who were continuing the theme from their previous games, putting in another lacklustre performance. Switzerland resumed play after the interval with bright intentions, being spured on by their fans who were making a lot of noise. They forced a couple of corners albeit no goals came to fruition. With just over 10 minutes gone in the second half, a bizarre incident occured. Antoince Griezmann, capitalizing on a defensive mistake, was bursting towards the goal until Watford man Valon Behrami put in a heavy challenge in which the official match ball popped! You don't see that very often. Antoine Griezmann had a decent chance to give his team the lead in the 57th minute if not for Yann Sommer. The Atleti forward exchanged swift passes with Gignac and unleashes a right-footed effort towards the goal that Sommer tipped over. Brilliant stop from the Borussia Mönchengladbach keeper. France, in need of a spark to ignite the game, turned to Dimitri Payet who was brought on for Kingsley Coman in the 63rd minute, a change French fans were clamoring for. Switzerland enjoyed more of the possession in the second half, keeping the French pegged back in their own half. But once France did get the ball, especially Sissoko, they caused troubles for the Swiss on the counter attack. The Newcastle man, known for his stamina and energy, would frequently burst forward from midfield, causing mayhem for the flat-footed backline of Switzerland. As a result of this, France had an almighty chance to go ine up in the 75th minute. Sissoko made an energetic run from midfield, beating two men for pace down the right flank, where he put in a long cross to a trailing Dimitri Payet. The West Ham talisman opened up his side foot and took aim, the ball bounced off the underside of the crossbar - but not past the line. If it had, what a goal it would have been. The rest of the second half remained extremely dull, with Xhaka' shirt being ripped for a second time being the main highlight. There was a chance late on for a dramatic finish when Payet had a free-kick at the edge of the box. 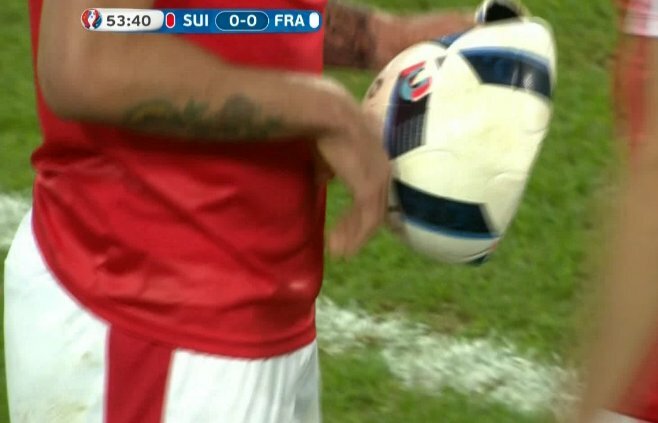 Switzerland must have had their hearts in their mouths but the free-kick went straight at the wall. The final whistle blew with the ball not having crossed the line once in the entire game. Nonetheless, France and Switzerland have earned progression from Group A through to the Round of 16. There were the occasional moments for glory when the crossbar was hit several times, there was some solid performances from players such as Cabaye and Sissoko, but all-in-all it was truly dull affair in Lille. If any of these teams are to go far in the tournament they will both need to vastly up their game.